Our FPL fantasy futból lineup is still holding down 2nd place, but multiple members of our squad have injury concerns going forward. We’re fortunate that bench players automatically get subbed in for points purposes if a starter does not play in his respective match. In our case, we started Luke Shaw despite his doubt for the match. However, he ended up not playing. However, Ryan Fraser got subbed in and hauled us eighteen total points from scoring two goals, assisting on another, and three bonus points. It was nice to see Wilfred Zaha score a goal and nab two bonus points. Also, Aaron Wan-Bissaka nabbed a total of nine points due to a clean sheet and three bonus points. We needed all those points due to not one but two defenders of ours missing this week due to injury. 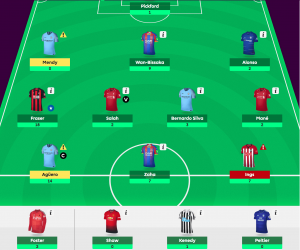 Both Mendy and Shaw did not feature this weekend. 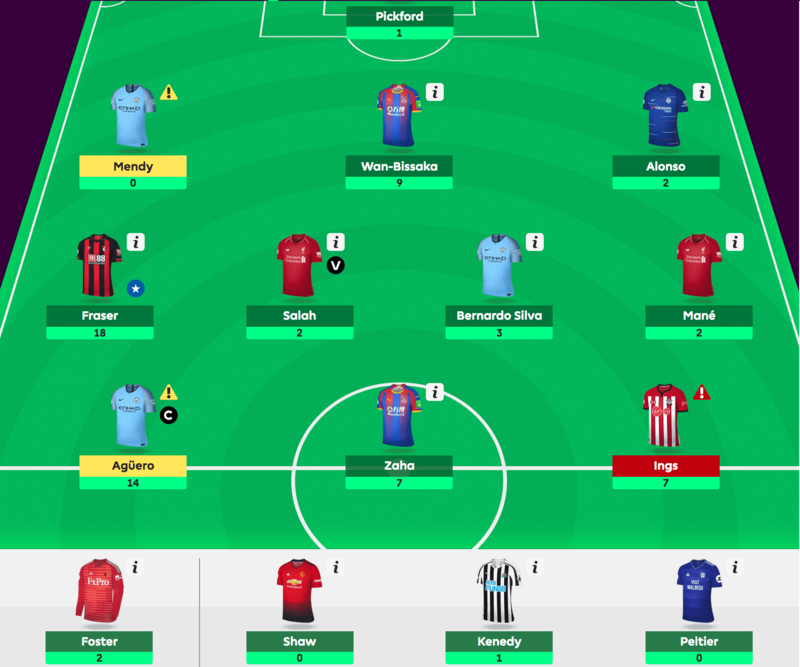 Since our one bench defender stayed off the pitch, we scored a big fat zero FPL points for one of our players. Well, it happened. We went against our own advice and knee jerked Marcos Alonso right at the start of the international break. We did this to lock in his price before it increased over the break. And while his price increased, we should have waited to sub him in for one of either Mendy or Shaw. 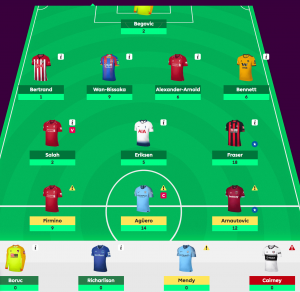 That move caused us to miss out on six total FPL points. Sergio Aguero hurt his ankle. If he’s out for next week, that leaves us with one available starting forward since Danny Ings is not allowed to play next week against Liverpool. Recall that the squad in 1st place after Game Week 20 will receive $450, and the team in 1st at the end of the Premier League season also gets $450. Stay tuned for next week to see whether we gained ground on the 1st place squad.